← Hollywood actor calls Western Wall ‘Myth’! In a recent interview with Russia’s Izvestia, France’s presidential hopeful Marine Le Pen, the anti-Muslim and pro-Jew leader of French National Front NF) said if elected, she would recognize Crimea as part of Russia. After the referendum, which showed the consent of the people to join Russia, I will also recognize Crimea as part of Russia,” stated Le Pen, noting that Crimea was only considered to be a part of Ukraine due to a Soviet administrative issue, but in reality the peninsula was never Ukrainian,” Le Pen said. It seems, Marine Le Pen is ignorant of Crimean history just like Islam. 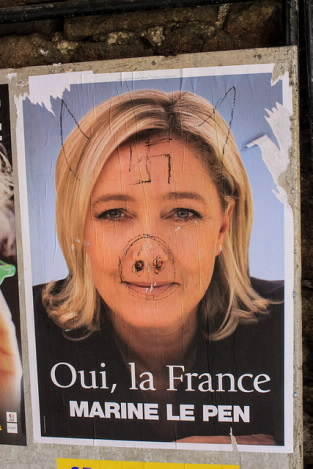 Le Pen is challenging fellow Zionists in April 2017 presidential hopefuls such as Manuel Valls, former prime minister with Jewish spouse, Emmanual Macron, a Rothschild banker, and a close friend of Nicolas Sarkozy, former president and a Mossad agent, and Francois Fillon, former prime minister under Sarkozy. Crimea seceded from Ukraine and became a part of the Russian Federation on the basis of a referendum held there shortly after the violent and Western-backed 2014 coup in Kiev. Unwilling to live under an illegitimate and openly anti-Russian regime. The Russian majority within 2.5 million Crimean inhabitants voted in favor of secession from Ukraine and reunification with Russia. Most Crimean Muslims preferred to stay neutral in the conflict. Historically, Muslim Crimea was invaded and occupied by Russian army during the rule of Catherine the Great in 1783. Following the Russian Revolution of 1917, Crimea became an autonomous republic within the Jewish-controlled Soviet Union (USSR). In 1954, Crimea was transferred to the Ukrainian Soviet Republic as a gesture of goodwill by Nikita Khrushchev. After the collapse of the USSR at the hands of Afghan Mujahideen in 1991 – Crimea became an autonomous republic within the newly independent Ukraine. Then came the US-EU colored regime change in 2014. Islam was introduced to the Crimean Peninsula by Arab traders in late 7th century. However, it was Mongol warlord Berke Khan who accepted established Crimean Khanate while converted to Islam. The Nakba of the Crimean Muslim Tatars began in 1944, when the Red Army drove the Germans out of the lush and beautiful Crimean peninsula. After establishing control, the Russians began to load the natives onto trains and deport them to Central Asia. They accused the Tatars of collaborating with the Nazi enemy, though among them there were many brave and distinguished soldiers who had fought on the Russian side against the Nazis. The Soviets dealt with them as arbitrarily as did the Americans with their own native tribes: some two hundred thousand people, 15 or 20 per cent of the total Crimean population, were declared ‘hostile traitors’ and shipped away.